Preheat oven to 325 degrees. In a mixer, beat the butter until creamy. Reduce speed and beat in powdered sugar and salt. Add cherry juice and almond extract and combine. With the mixer on low add the flour slowly, scraping the sides of the bowl as needed. Rolls the dough into 1" balls and place on a baking sheet. Press the center of the cookie with your thumb until the dough is about 1/2 inch thick. Sprinkle cookie with a little bit of sugar and bake for about 10 minutes or until the bottoms are lightly browned. Once removed from the oven, gently press a chocolate star or Hershey Kiss in the center of the cookie. Let cool and enjoy! If you'd like a printer-friendly version of this recipe, Click Here. Cheesy mozzarella and pepperoni with chicken? Brilliant! This amazing recipe is a fantastic family pleaser that will have you coming back for more! Enjoy! Preheat broiler to high. Heat a large saucepan over medium-high heat. Coat pan with cooking spray. Add garlic and pepperoni and cook for a few minutes until garlic starts to brown, stirring frequently. Add oregano and marina sauce and bring to a boil. Turn heat to low and add basil. Heat a large skillet over medium-high heat with one teaspoon olive oil. Sprinkle chicken with a little bit of kosher salt and fresh pepper. Add chicken to skillet and cook for 5 minutes on each side or until cooked through. Transfer chicken to a baking dish and spoon marina sauce over the top. Sprinkle evenly with cheese and broil for several minutes until cheese melts. Remove from broiler and enjoy! If you'd like a printer-friendly version, Click Here. "Today is a new day. You will get out of it just what you put into it." Heat oven to 350 degrees. In a medium shallow bowl, whisk together eggs, milk, vanilla, and cinnamon. Spray a large skillet over medium-high heat sprayed with Pam cooking spray with butter. Dip bread into egg mixture and coat on both sides, letting excess drip off. Place in skillet and cook until bread is golden brown on both sides. Transfer toast to a baking sheet and place in oven for 5 minutes. Meanwhile place berries in a small to medium saucepan and heat over medium heat. Add honey, Splenda, and lemon juice. Cook until berries start to break up and add corn starch to thicken slightly. Serve berry sauce with french toast and enjoy! If you'd like a printer-friendly version of this recipe, Click Here. Enjoy your toast, bacon and eggs all in one cute little low-point cup! :) These very easy-to-make breakfast cups are a fun way to start your day! Enjoy! Heat oven to 400 degrees. Cook bacon (on stove or microwave) until just starting to get a little crisp. Set aside. Spray muffin pan with cooking spray. Cut the crust off of the bread, flatten it a little, and press each slice into a muffin cup. Place bread in the oven for 5 minutes. Meanwhile, mix the eggs and milk. Remove the muffin pan from the oven (bread should be a little toasted) and spoon egg mixture into bread cups. Break up the bacon into little pieces and add to each cup of egg mixture. Place about one tablespoon of cheese on top of bacon and egg mixture and place in the oven for about 10 minutes (or until the egg has set). Remove, season to taste if desired, and enjoy your breakfast. Or lunch. Or dinner. :) If you'd like a printer-friendly version of this recipe, Click Here. Would you like a cup of coffee? A muffin cup -- of coffee? These scrumptious chocolate chip coffee muffins will give you your coffee AND chocolate fix. With a dab of creamy icing to finish, this is one "muffin top" that you won't mind seeing. Easy to make and even easier to devour! Enjoy! This red pepper corn relish is excellent when eaten as a cold side dish. Very low in points and one of those tasty sides that lasts for quite awhile in the refrigerator. Heated up and placed on top of a delicious 4 oz. piece of white flaky Barramundi fish? Exquisite!!! A taste you're sure to enjoy! Combine all ingredients for red pepper corn relish and refrigerate. (This relish gets better and better after being in the refrigerator for a day or two.) In a large skillet, heat 1/2 Tbs olive oil over medium-high heat. Sprinkle Barramundi with salt, pepper, and a little Adobo seasoning. Place in skillet and cook (sear) on each side for approximately 5 minutes. Remove. Retrieve red pepper corn relish from the refrigerator and have as a side dish or heat it up and spoon on top of Barramundi. Enjoy this excellent entre'! If you'd like a printer-friendly version of this recipe, Click Here. "When Mother Teresa was asked, 'What can we do to promote world peace?' She replied, 'Go home and love your family.'" Preheat oven to 350 degrees. Combine cake mix, oil, eggs, 1/3 cup pineapple and mix well. In a small saucepan, heat butter over low to medium heat and stir in brown sugar, pecans, and 8 oz. pineapple. Line cupcake pan with paper cupcake liners. Place a small spoonful of the butter and pineapple mixture into the bottom of the cupcake liners. Add a spoonful of the cake batter on top and repeat until all 12 cupcakes are filled. (NOTE: I had leftover cake batter that I poured into mini cupcake pans, sprinkled a little brown sugar on top and placed one pecan in the center. I baked those for about 10 minutes or until a toothpick inserted into the middle came out clean.) For the larger cupcakes, bake for 15 to 18 minutes or until a toothpick inserted into the middle comes out clean. Remove paper lining and place cupcakes on serving plate upside down with the pineapple mixture on top. Enjoy!! If you'd like a printer-friendly version of this recipe, Click Here. Place the ricotta cheese, cream cheese, and heavy cream in a food processor and blend until smooth. Transfer to a bowl. Chop a handful of grapes rather small. Add grapes to mixture and combine. (NOTE: This mixture only makes 6 or 7 tasting tablespoons of this sampler.) In a separate bowl combine walnuts, sugar, and parsley. Spoon one tablespoon ricotta mixture into tasting spoons or petite goblets or tasting bowls (small, tasting ramekins). Add one teaspoon of the pecan mixture on top of each serving and top with a half of a grape. Refrigerate for at least 2 to 3 hours. Enjoy! If you'd like a printer-friendly version of this recipe, Click Here. Blue cheese, with walnuts, and grapes? How can you go wrong? These scrumptious appetizers are a big hit at any party, even with people who don't care for the blue cheese flavor (like myself)! Enjoy these along with my wonderful "Ricotta and Pecan Samplers" for ultimate savory satisfaction! Heat oven to 300 degrees. Arrange walnuts on a baking sheet and bake for 7 minutes. Place blue cheese, cream cheese, and heavy cream into a food processor and blend until smooth. Transfer to another bowl. Place walnuts, splenda or sugar and parsley into a separate bowl and combine well. With clean hands, take the blue cheese mixture and gently form a small ball around a grape. Roll ball into walnut mixture and set on a plate. Continue until blue cheese mixture is all used up. (This made 13 balls for me). Refrigerate balls for several hours before serving. Enjoy! If you'd like a printer-friendly version of this recipe, Click Here. If you forget to add the ice cream, it's completely understandable! These delightfully-sweet carmeled bananas make it difficult to use as a topping. All you need is a spoon and you're good to go! :) However, someone in your family is bound to complain, so place it on top of some creamy fat-free vanilla ice cream and witness the smiles! Very easy and delicious! Heat butter over medium-high heat in a saucepan. Add brown sugar and stir until dissolved. Combine bananas, coating thoroughly. Remove and place on top of ice cream hot or cooled. Amazing both ways! if you'd like a printer-friendly version of this recipe, Click Here. NOTE: Banana topping total servings is 6, 1/4 cups. Tomatoes, capers, olives, and pine nuts are just a few of the ingredients that help make this a magnificent and memorable main dish. Perfectly baked swordfish marinated in teriyaki is terrific standing alone, but adding the fresh tomato tapenade makes this dish out of this world! Heat oven to 400 degrees. Sprinkle swordfish with a little pepper and marinate in teriyaki sauce for at least 1 hour. Place swordfish in a baking dish and bake for 15 minutes. Meanwhile, heat olive oil in a skillet over medium-high heat. Add tomatoes and garlic and cook for 2 to 3 minutes. Add the rest of the ingredients, turn down heat, and cover for 15 minutes, stirring occasionally. 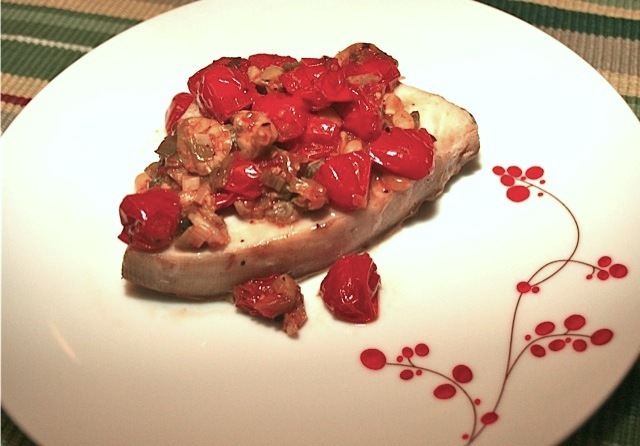 Remove swordfish from oven, spoon tapenade over swordfish and enjoy! If you'd like a printer-friendly version of this recipe, Click Here. Preheat oven to 350 degrees. Sprinkle salt and pepper on chicken and place in a baking dish. Bake chicken for 15 minutes (or until desired doneness). Meanwhile, heat skillet over medium-high heat. Add mango, orange, and garlic. Cook for 5 minutes or so until the garlic softens. Add splenda and the rest of the ingredients, turn down heat, and let cook for 15 to 20 minutes (stirring occasionally). Remove chicken from oven and spoon chutney on top of chicken before serving! If you'd like a printer-friendly version of this recipe, Click Here.